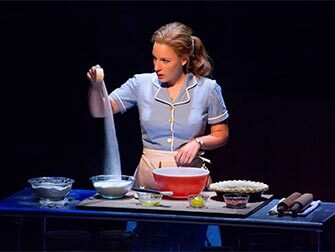 Purchase your Sara Bareilles’ Waitress on Broadway tickets before leaving for New York. Buying your theatre tickets online is easy and saves you time and money. The musical Waitress is directed by Adrienne Shelly and based on the homonymous movie. The show tells the story of an unhappy waitress who’s hoping for a better life. Sara Bareilles, who achieved success with her famous hit single ‘Love Song’, wrote the music. The musical is performed in the Brooks Atkinson Theatre and is the first Broadway show in history with the top creative spots filled exclusively by women. Waitress tells the story of Jenna, who lives in an American town and works as a waitress in a diner. Although she’s pregnant, she isn’t at cloud nine at all as she’s being mistreated by her abusive husband. Jenna dreams of another life and seeks distraction in baking cakes. She comes up with creative names such as ‘Getting Out of the Mud Pie’ and ‘Lonely Chicago Pie’. Because of her pregnancy, she ends up visiting the new doctor in town. This visit might be the start of something new, something she was hoping for. She also gets the chance to participate in a pie baking contest organised by another town. Will Jenna be able to find the recipe for happiness? How to buy Waitress on Broadway tickets? it is easy to buy tickets for Waitress with the link below. I recommend buying tickets online before your trip to New York. Why? A lot of Broadway musicals are very popular and are often sold out. You’ll also save time and money and most importantly you don’t have to stress about finding tickets when you are in New York. 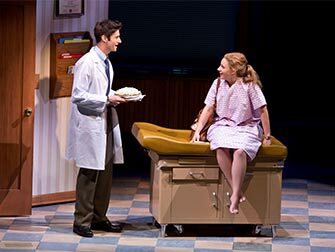 Eric’s Tip: Waitress is an unusual story for a Broadway musical as it deals with sensitive subjects. There is a lot more focus on the story rather than for example the dancing. Nevertheless, the songs are very catchy and if you are familiar with Sara Bareilles’ songs then you should definitely recognise her distinct sound throughout the entire musical. Don’t want to see Waitress?